Happy Friday everyone. Just wanted to share a few things I'm loving, wishing for, or already own and use. 1. Teal Ankle Strap Pumps - These have made their way into my closet and they are really cute and comfortable. They also look better in person. 2. Skinny Jeans - I think I've found another brand of jeans that fit my body type. I'm loving the DKNY Brand. Mid rise, fits everywhere, right amount of stretch...just perfect. My purple skinnies are also DKNY. 3. Long Sleeve Textured Peplum - This is on my wish list but may get sold out soon. Too pricey for me right now. I love the texture and I love anything peplum. 4. mark Powder Buff Foundation - This works as a concealer, foundation and powder. This is what I use when I'm rushing out of the house in the morning. I apply two layers and I'm good to go. 5. Sparkler Bracelet - These bracelets make the perfect gift. I own the one in rose gold. Layer with a boyfriend watch or wear alone. 6. Mark Say Pleats Dress - A burgundy dress is perfect for that holiday party. 7. Scarf Set - You can never own too many scarves. 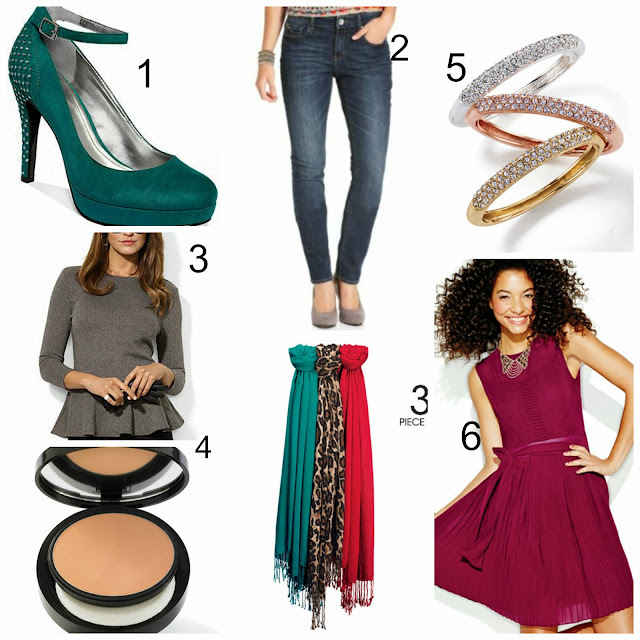 Leopard, Teal and Orange...These are great colors to update any outfit. Oh I love that burgundy dress! You're right, it is such a perfect holiday color.